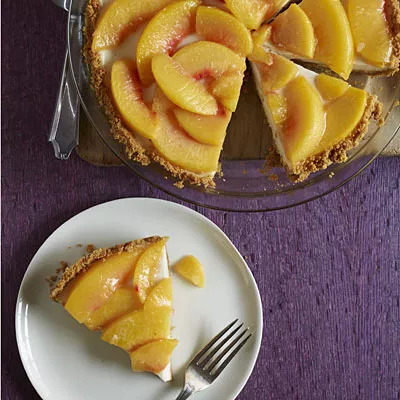 You love peaches, you love pie, you're going to love this vanilla-roasted peach pie--and there's more to it than just great taste. The filling is made with Greek yogurt, unsweetened almond milk, and light brown sugar, so this pie is only 185 calories per slice. You love peaches, you love pie, you're going to love this vanilla-roasted peach pie--and there's more to it than just great taste. The filling is made with Greek yogurt, unsweetened almond milk, and light brown sugar, so this pie is only 185 calories per slice. Simple beat graham cracker crumbs, unsalted butter, sugar, and canola oil with one egg white to make the crust, and bake for 10 minutes. Then mix up the filling, pour into the crust, and top with roasted peaches.Yum!